At the end of the renewal period, when the number of billing cycles reaches zero. Subscription cancellation can happen due to various reasons. If a subscription gets canceled for any of the below mentioned cases, the subscription_canceled event will notify you the reason for the cancellation. If the subscription gets canceled due to any other reason, the subscription_canceled event will not hold the reason for cancellation. The below table explains the various options available for each setting. When a subscription has to be canceled Cancel immediately: Cancels the subscription immediately. Cancel at end of term: Waits till the end of the term and then cancels (changes the subscription status to non-renewing). When a subscription is canceled mid-term, how should the credits for the unused period be handled. Don't issue credits: The subscription is canceled without giving any credits for the unused period. Issue full credits: Issues full credits for the entire term. If there are existing refundable credits Retain credits: No action is taken against the credits. Initiate refund: Initiates the refund of the credits. If there are existing unpaid invoices for the canceled subscription Retain as unpaid: No action is taken against the invoice. Attempt Collection: A charge is attempted on the available payment method if auto-collection is enabled. If the payment fails, the invoice is retained as payment due. Write Off: The amount due is written off. 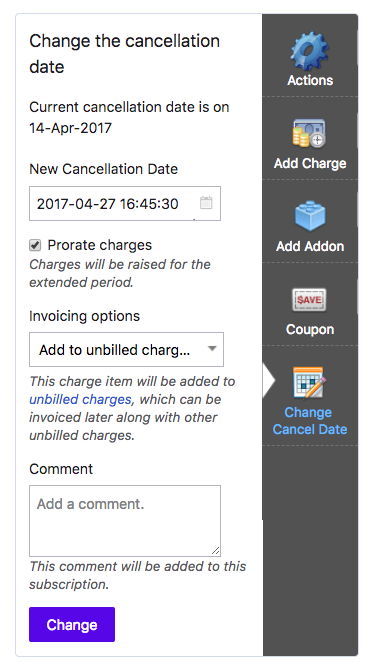 If there are existing unbilled charges for the canceled subscription Invoice Charges: The unbilled charges will be invoiced and a charge is attempted on the available payment method if auto-collection is enabled. If the payment fails, the invoice is marked not paid. Delete Charges: The unbilled charges will be deleted. Apply refundable credits/excess payments, if any, to unpaid invoices. This toggle allows you to apply to the unpaid invoices, any refundable credits/excess payments that are present for the customer record. 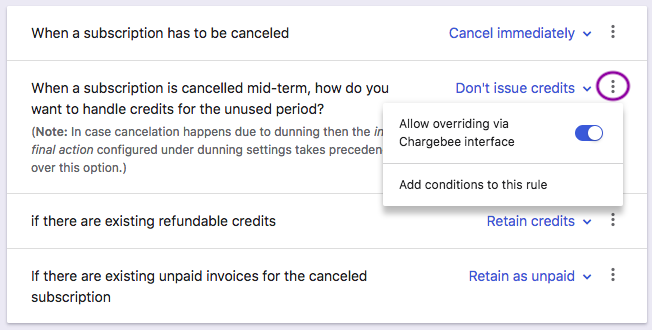 Chargebee also allows you to override the default settings or add a condition. You can perform these actions by clicking the vertical ellepsis available next to each setting. Allow overriding via Chargebee interface: By enabling the Allow overriding via Chargebee interface for a setting, you can allow your users to override the default option. Add condition to this rule: A different behavior can be set for subscription cancellations based on whether the cancellation is invoked via the web interface, API, by the customer through the Self-serve Portal or due to scheduled cancellations. To avoid credit card disputes (chargebacks), it is recommended to have a clear and precise cancellation/refund policy in place with your customers. The subscription can be canceled only immediately. 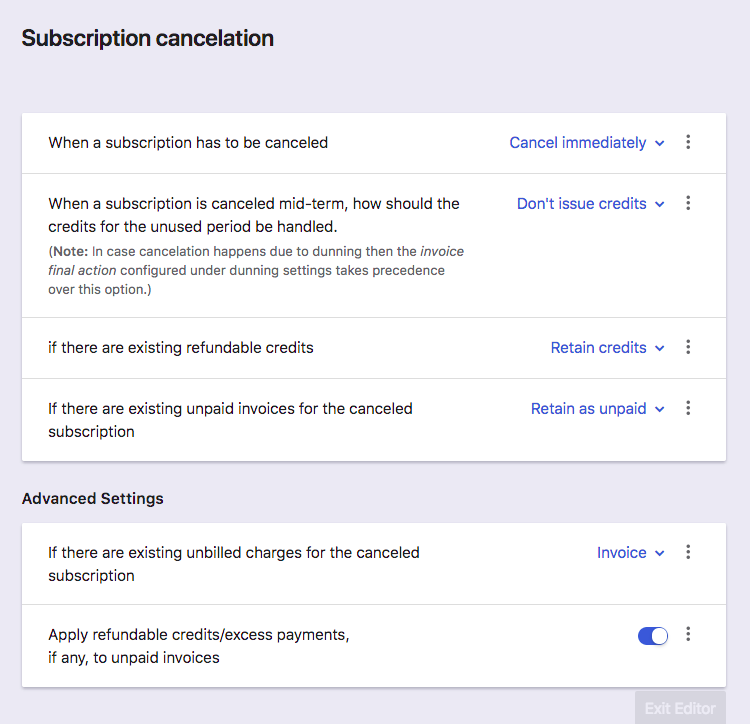 There is no option to set it to cancel at end of term after the subscription gets activated. If you want to cancel it at the end of the first term, you can use the Change Subscription operation and set the number of billing cycles to 1. When the number of billing cycles increases for a subscription or when the subscription is changed to a plan that has a different term period, it will switch from non-renewing state to active state. If the number of billing cycles for a monthly subscription, scheduled for cancellation (number of billing cycles set to 0) is set to any non-zero number, or if the plan is changed to a yearly one using the Change Subscription operation, the subscription will become active. Customers can be offered a way to turn their subscriptions to active from non-renewing by extending their subscription. The date of cancellation for a subscription which is scheduled to be canceled upon the next renewal can be changed via web interface (using the option Change Cancel Date available on the right side panel of the subscription details page) or using the Change term end API. If the cancellation date is postponed, the subscription will still continue to be in the non-renewing state, until the cancellation date. An option to raise prorated charges for the extended period is also made available while performing this action. To re-start the billing for a canceled subscription, you need to ‘reactivate' your subscription. Learn more.